The first book I reviewed on this blog was The Atlantis Complex, the penultimate book in the Artemis Fowl series. It was one of the more awful books I've ever read. It made me dread the next book - this one - that would conclude the series I had loved and read and reread many times over since I was 12. Would Colfer be able to offer up a ending that was at all satisfying after putting out the tragic mess that is The Atlantis Complex? I am happy to be able to report that The Last Guardian is better than The Atlantis Complex. By how much is debatable. Thankfully, there is a lot less silliness and ridiculousness in this book than the previous. However. I cannot forgive the two extremely minor characters with 'humorousness' names, of only one I can remember - Kolin Oskopy. I loved this series for its intelligent humour and I would not call this intelligent humour. There were a couple moments where I gasped or had to look up from the book because I was shocked, because I couldn't believe something actually happened. Happily this was for good reasons, not because something ridiculous was going to happen. It was more 'Oh my gosh, is that actually going to happen, that can't happen, if it happens...OH MY GOD IT HAPPENED.' 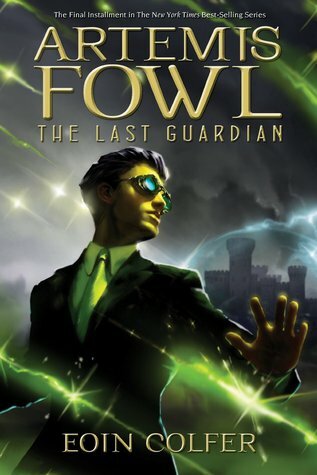 which was nice because I haven't had that feeling from an Artemis Fowl book since the fourth one (RIP Root ;_;). I got excited and smiled this big silly grin when a lot of the characters first appeared (especially Mulch! And Foaly, and Trouble...). While most of the time I just felt really happy to be with all these characters I've come to love, to just read about them saying their usual lines, acting in their usual manner, Butler felt really OOC for me. I know he can't be OOC when he is being written by his creator but...All the other characters felt like they've always felt, but Butler just felt out of whack and not himself at all...meh. I do like how you can really see/feel the development of Holly and Artemis' characters from the first book. I love how their relationship has grown (I also love that the author choose to pretty much dispense of everything that happened in the previous book XP). The death of a certain character was pretty lame, I would have liked to see it be a little more significant for the other main characters. Overall, the story itself was a bit lacklustre despite its large scale. Fortunately, though, all the characters we've come to know and love were there, acting in the ways we've grown familiar with. There wasn't anything particularly fresh or new or exciting about this book but it did give us a final chance to spend some time with these characters and I'm okay with that. Ideally the series would have ended with a fifth book (perhaps even the fifth book, just with some modifications to make it the end of the series) but I'll settle for this conclusion.